DAMANSARA Jaya residents are unhappy that the planning approval for the proposed development at the Atria Shopping Centre site was renewed without their knowledge. According to Damansara Jaya Residents and Owners Association (DJROA) president Datuk Yew Cheng Hoe, they only found out about the renewal when tenants of the shopping centre were given notices to vacate the lots. “We’ve been asking for the Traffic Impact Assessment (TIA) and Social Impact Assessment (SIA) from the developer since last year but we only received it this May,” Yew said. 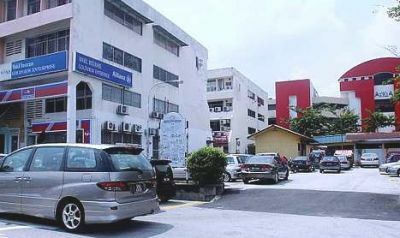 Talks of redeveloping the iconic neighbourhood mall in Damansara Jaya, Petaling Jaya, first surfaced during the last general election in March 2008 and residents protested against the development, citing potential traffic congestion with such a high-density project. The initial plan submitted to the Petaling Jaya City Council (MBPJ) was for a 33-storey building on top of four levels of shopping podium and 3½ levels of basement parking, which was eventually scaled down to 22 storeys. Big plans ahead: The project also includes the car park and food court next to the post office, which is on state-owned land. When the planning approval expired after a year, the developers applied for a renewal of the permit. It was during a meeting with the developers in April 2009 that residents asked for the TIA and SIA. “One of the conditions under the renewal of the planning approval was that no further decisions can be made unless they submit the TIA and SIA to us so that we can scrutinise it,” DJROA vice-president Ronald Ng said. Ng said the developer had already submitted the TIA and SIA to MBPJ in September but residents never received a copy until May this year. According to Billy Wong, an aide to Petaling Jaya Utara MP Tony Pua, the planning approval was renewed in July 2009 during the MBPJ One-Stop Centre meeting. “However, one of the conditions of the approval was that no further decisions on the project could be made pending the submission of TIA and SIA to DJROA for their perusal and comments. “This was not complied with when MBPJ approved the amended plans in March 2010,” he said. 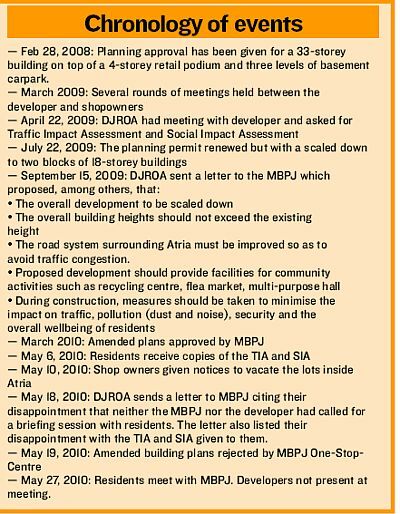 He also said when the MBPJ renewed the amended plans in March for two 18-storey blocks from the original 33 storeys, a fresh application should have been submitted and a new noticeboard put up to inform residents. Wong added that the developer had submitted their building plans for approval at the OSC meeting last month but was rejected because certain conditions were not complied with. “We are also not pleased with the reports given to us. It’s vague and does not provide any additional details compared with the initial reports. There are no suggestions on how to improve the existing infrastructure and road system,” said Ng. He said the traffic assessment should be done by a consultant appointed by the MBPJ and approved by the residents instead of by the developer. “It was stated in the traffic report that traffic has gone down by 20% since an earlier report done two years ago and we find that hard to believe. We were not even aware of that report,” he said. Ng said parking was a problem in the commercial area and having a high-rise building would worsen the situation. Yew said they were also concerned that the development plans included the taking over of two pieces of state-owned land that were now used as a carpark and food court. “If the land is still owned by the state, then why should the developer be allowed to include them in its development plans?” Yew asked. He said residents did not like the idea of using the land to build a structure that would serve as the front entrance to the mall. Wong was in agreement: “What we want to know is how the first planning approval was granted in February 2008 when the issue of the two pieces of government land have not been resolved. Yew added that the association and its members were disappointed with the council because it had failed to keep residents updated on the progress of the development. He also said no proper objection hearing was held that involved the residents and no proper signboards have been put up by the developer to inform the public about the project. Pua hoped that the issue could be resolved amicably and all parties involved could have a proper discussion regarding the development. “We hope that the developer will respect the residents and hear their views,” said Pua. When contacted, MBPJ public relations officer Zainun Zakaria said the issue would be brought back to the one-stop centre committee meeting this month. When contacted, the developer declined to comment on the matter.